For occasional allergies and head colds Tylenol Sinus Congestion & Pain is a great option. I've found that this is very effective when taken at the very first signs of an allergy attack or head cold. It relieves the symptoms of pressure in the sinuses and helps all the congestion to just disappear without leaving me dry as a desert. The pills work reasonably quickly, but do not seem to last particularly long. I've noticed that if I take them with breakfast I'm definitely feeling the need for another dose by lunch and yet another dose by dinner. It's a pain to have to take that much medication in a single day, but it is definitely better than suffering. For occasional use this is a great option, but it is definitely not for those with long term allergies. I do not use it for my seasonal allergies (if only because i'd be going through a box every other day at the recommended dosage) because it can be a bit too drying after the second or third day of use. But for fast relief for short term issues this is a great option. Great cold fighter during the day. If you have to go to work or have things to do with the children and you are having sinus issues, Tylenol sinus is the right move. This medication relieves the pain from sinus pressure and also helps with the headache you might get from all the pressure going on. What makes this medication really special is that it does not make you feel sleepy and you are able to go along with your day with no problem. You might need to take a second dose by the evening because it does not last all day long in my opinion. But the the medication does work and takes care of the congestion and pain that comes with seasonal allergies. Effectiveness The medication work for me with my allergies due to the change of the weather. I must stress that this is a daytime formula which makes it perfect to use even if you have a long day ahead of you. 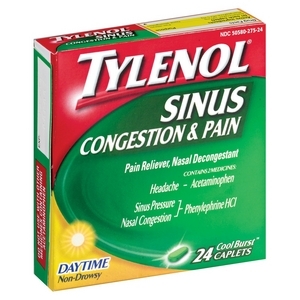 Tylenol Sinus is definitely a medication I would recommend. But like any medications follow the instructions on the box provided for you or what your family doctor tells you. Ease of Use Tall glass of water and swallow the pill. Very easy, no problems. Immediacy Give it a hour or two before you start feeling much better. Like most medications, it needs to absorb into your system before it can start it's magic. I have suffered with sinus troubles ever since I was a small child. I am usually very consistent with the sinus medication that I use, but I tried Tylenol Sinus Congestion and Pain one time just to see if I liked it or not. This product is very price friendly. I felt immediate sinus headache relief from the Tylenol, but it did not relieve my sinus congestion very much. It did make my sinus congestion loosen up, but it made me sneeze, cough and blow my nose more often with not much relief. Bottom line: I would recommend this product in case of emergencies. Also, it might be appropriate for someone who suffers the occasional sinus headache, but it is not effective for someone who suffers from year round symptoms of sinus troubles. 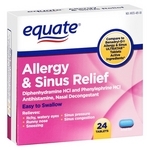 Effectiveness This product works okay, but it is not the best on the market when it comes to relieving sinus congestion. Ease of Use I had a very hard time remembering to take this medication as often as I needed to. The tablets aren't that hard to swallow. Immediacy My sinus headache went away very quickly, but my sinus congestion was not helped that much. 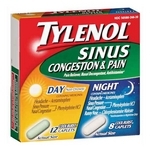 Tylenol sinus congestion and pain daytime caplets are awesome. I start using this product as soon as I see the first sign of congestion. Other brands I use to take for sinus congestion can't compete with this brand. Effectiveness This gel caplet is very effective, and long-lasting. Within a couple of minutes after taking this gel caplet, I am able to breathe again. It works by opening up my sinus passages and providing me relief. This product also helps take away the pain and pressure that comes along with sinus congestion. Ease of Use The small and unique gel caplet form of this pill makes it extremely easy to swallow, it slides down so easily. I use to have such a hard time taking other brands of sinus medicine in the past, they always tasted so nasty and bitter that it took me about three tries before I could even swallow the pill. Immediacy This product provides pretty instant relief, I usually start seeing results within about five to ten minutes of taking this product. 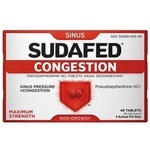 Overall this medication really helps to relieve and ease sinus pressure. Effectiveness After having a bad cold for almos 2 weeks, I bought this product (partly because it was more reasonably priced than Advid Cold and Sinus) and within two days I feel better than I have in 2 weeks. It causes a lot of sinus drainage just like the package says, so if you don't want to have to blow your nose a lot, this is not the medication for you. The sinus headaches I have been having evry day for two weeks are now gone within thirty-six hours of starting this medication. Ease of Use The pills are not hard to swallow. The packaging is not hard to manage. Immediacy I started to feel better by the next morning after beginning to take this medication. I cold feel my sinuses draining and my sinus pressure lessening already during the day after my's I was feeling the effects of this product and the other cold medicines I took within an hour of taking them. Let me start by saying that I suffer from severe sinus congestion and pain and I have tried just about every product on the market. I have tried both name brands and generic versions, looking to find something that not only alleviates the pain and pressure but does so quickly. a lot of products out there either do not work at all or take far too long to kick it. And when you have a sever headache, the last thing you want to do is wait for extended periods of time for the pain to go away. Tylenol Sinus Congestion & Pain not only works very well to alleviate congestion and pressure pain, but it also works relatively quickly. I would have to say that my symptoms start to get better within 20 minutes or so from the time I take the pills. Unlike other products that tend to take 45 minutes to an hour, this is a huge time saver. The pills are not freakishly big and are actually very easy to swallow. I also like the fact that you do not have to wait long periods of time before you can take another dose if you need to. Would definitely recommend! I always have this product on hand at work, in my office and at home. It never fails, with three kids in public school and having a job dealing with the public, I usually get sick every other month or so. The majority of my pain comes from sinus congestion in my nose and head, even through my ears. I have been in so much pain before, I went to the local pharmacy and stocked up on all sorts of OTC medications. I really like Tylenol Sinus Congestion & Pain. It does a great job of relieving the sinus pain until I can get to the doctor for a prescription. I can always tell when my dosage is wearing off and realize how well the medicine is working to relieve the pain. And it works fast too, one of the fastest on the market that I have found. Effectiveness Does great relieving the pain and swelling you can have with sinus congestion. I would not recommend taking everyday, only when relief is needed before you receive doctor's care. Ease of Use Very easy to take and works fast. No yucky medicine to drink, just pills. Immediacy Works quick to immediate relief. Tylenol sinus congestion and pain doesn't really work. 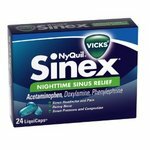 Tylenol Sinus Congestion and Pain day time Rapid Release Gels is a medicine that is supposed to relieve many sinus symptoms. This product really did not work that well for me. It is a bit on the pricey side and there are many other products that work better then this one.